President Thein Sein’s government makes the case that it is prudently managing a successful transition to democracy. Shortly after coming to power in 2011, Thein Sein — a former general and prime minister in the previous military government — instituted economic and political reforms that resulted in Western nations largely lifting trade and investment embargoes they had maintained against the previous military government. This spurred foreign investment and much-needed economic growth. Supporters of the opposition National League for Democracy see the country’s democracy as half-empty rather than half-full. They believe the generals and their cronies have too much of a vested interest in the status quo to challenge exploitation of natural resources and ensure economic justice. The euphoria over long-overdue reforms has already gone sour, as new political prisoners have replaced those freed in mass releases, prior censorship has been replaced by lawsuits against the press, and liberalizing the economy has failed to solve problems such as income inequality and land grabbing. The government has also come under criticism, mostly from abroad, for failing to stem violence against the Muslim Rohingya minority, who are also denied citizenship. Some Buddhist monks formed a group to channel the anti-Muslim sentiment into a political force that has already successfully lobbied for laws restricting the Muslim community. The monks’ group does not support the National League for Democracy because it considers the party soft on the issue. The party and its leader, Aung San Suu Kyi, have also disappointed admirers by failing to stand up for Muslims’ rights. The 2010 election was boycotted by the National League for Democracy, which saw it as illegitimate and unfair. It won 43 of the 44 seats it contested in 2012 by-elections. But its small share in the 664-member parliament meant it could not challenge the authority of the ruling Union Solidarity and Development Party and its ally, the military, which allotted itself an automatic 25 percent of parliament’s seats when it drafted a constitution in 2008. For the NLD, Sunday’s polls are a chance to test the mandate it won in the 1990 election, when it garnered just over 80 percent of the seats, only to have the polls annulled by the military. There are 91 parties running candidates, but the election is a two-horse race, with several wild cards. Suu Kyi’s NLD has popular support across the board, in city and countryside, and is expected to win a strong plurality. President Thein Sein and his USDP have a well-organized political machine with all the advantages of incumbency, including the opportunity to rig the vote if they so choose. They also enjoy the support of many of the country’s tycoons, whose status as cronies to the previous military regime carried over to the military-backed ruling party. With its automatic 25 percent of the seats in parliament, the army does not need to campaign, but it can use its strong presence in the vast rural backwaters to intimidate voters to the advantage of its USDP allies. Parties representing the country’s various ethnic minorities are likely to win seats in their home regions. While most are at least loosely allied with the NLD, the votes of their lawmakers will be in play when it comes time for parliament to select the nation’s president early next year. Last month, the government signed a cease-fire agreement with many of the country’s fractious ethnic minority guerrilla groups, nominally putting an end to decades of armed conflict. But major groups with the heaviest firepower stayed away from the accord. Also, many cease-fires have come and gone over the decades of ethnic insurgencies, and like them, the latest makes no concession to the bedrock demands of the ethnic groups for greater autonomy. Not included among the cease-fire groups are the Kachin, whose combat against the government has been the fiercest in recent years. 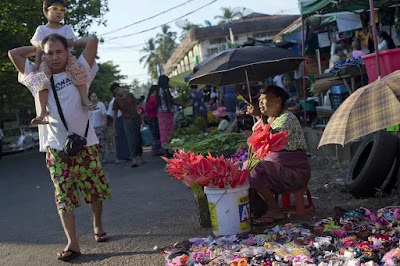 They believe there can be no last settlement of ethnic complaints under a government dominated by the military, which claims that aggressive counterinsurgency is crucial to maintaining national unity.